Slow paying customers are common within the construction sector. Their unpaid accounts payable can tie up a lot of your working capital. 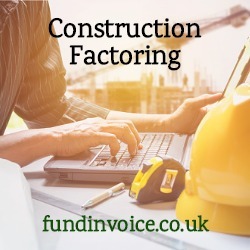 If you need more funding to take on new projects, or you have been turned down for construction finance by a bank or you have contracts that you can't fulfill, construction factoring could be the answer for you - by unlocking your business cash flow. Prepayments against unpaid invoices or applications for payment - instant cash. Credit control service and sales ledger management. Protection against bad debts (this may be optional). The prepayments free up cash from your outstanding accounts receivable (these are your invoices or applications for payment raised to your customers), you can stop waiting to get paid, you get a proportion of the value up front, and the balance is passed on (less the factoring fee) once the customer pays. There is no limit to the level of funding that can be released in this way, it grows as your turnover grows. The more sales you make, the more receivables you have, the more funding is generated - the funding is unlimited. Contractual debts and stage payments (or progress billing) can all be funded. If you don't like the idea of funding all your invoices, there are selective factoring (also called Spot Factoring) services that allow you to pick and choose the transactions that you submit. Even if you have been declined or turned down by a bank for construction finance, you are still likely to be able to qualify for construction factoring. There is no requirement for collateral to secure the facility, beyond the receivables that you are being funded against. The credit control and ledger management frees up your time to focus on running your business, instead of chasing people for payments. To discuss your funding requirements and to understand the costs, please call Sean on 03330 113622. Read case studies and more about: Construction Factoring.